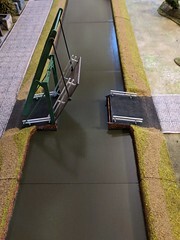 Recently I redirected funds from online sales of extra merchandise and purchased the new Crescent Root Studios 28mm Warehouse Set. I have a few buildings from their 15mm line, and they are definitely some of the best terrain pieces in my collection. When I saw that they had released this new 28mm set I thought it would work well for In Her Majesty’s Name, my Lovecraftian project, and WWII, so I took a chance and ordered the complete box set. After placing my order I received a shipping notice two days later, and the parcel was delivered within three days for a very quick turnaround. The set comes packaged in a sturdy cardboard box, and all the components are contained in ziplock bags. The box set consists of one large two story building with a one story wing, a medium one story building, a small one story outbuilding, two pre-built platforms, and seven pre-built wall sections. All components are pre-painted laser cut MDF. At first inspection, the quality of the components is evident. The platforms are well assembly and sturdy, the finish is excellent, and the relief etching does a good job of depicting different building materials. Also noticeable is the universal odor associated with laser cut buildings. Although it is present, it is not nearly as pervasive as other manufacturer’s terrain that I have experienced. After having the bags opened and the parts out, it became hardly noticeable. As a test run, I assembled all of the buildings and was able to finish them in about twelve minutes, and then disassemble and repack them in ten minutes. The way the pieces fit together is quite intuitive, and the precision of the cuts facilitates alignment when butting the walls together. Additionally the upper and lower floors of the large building have tabs and corresponding notches for alignment – another nice touch. Overall, I am extremely pleased with this set and impressed with the quality of the buildings. The addition of the removable doors and the ability to easily disassemble and store these flat adds great value for me. I can’t recommend this warehouse set enough, and I look forward to upcoming releases in this range. This warehouse set is available direct from Crescent Root Studios for $129.00 USD plus shipping. 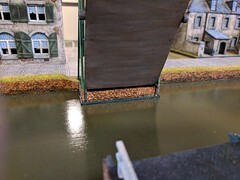 This entry was posted on Tuesday, August 27th, 2013 at 14:52	and tagged with 28mm, Miniature Games, Reviews, Terrain, WWII and posted in Reviews, Terrain. You can follow any responses to this entry through the RSS 2.0 feed.